If someone took my circular polarizer filters away, I don't know what I would do. I would be completely lost when photographing landscapes. And in many other indoor and outdoor situations, I would feel very limited. No other filter will do more to add "pop" to your images. Getting better image quality by using a circular polarizer filter is so easy that it almost feels like cheating. Want to skip straight to the recommended circular polarizer filters? Just click here. What does a circular polarizer filter do? Primarily, a circular polarizer filter cuts glare and reflections, allowing deep, natural colors to show through with great saturation. This effect is perhaps most noticed in blue skies where white clouds will pop from the darkened blue skies. 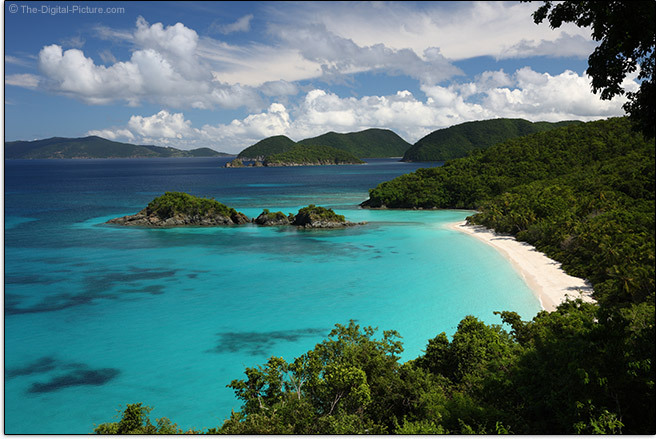 For example, notice how rich the colors are and how the clouds stand out in the Trunk Bay picture below? This picture would not be the same without a circular polarizer filter in use. The enhancement provided by a circular polarizer filter would be extremely difficult and time consuming to replicate in Photoshop, if even possible at all. The amount of enhancement provided by a circular polarizer filter is adjustable. The end of a circular polarizer filter rotates continuously in either direction, allowing you to dial in just the right amount of effect. The changes will be noticeable in 90 degree rotation amounts, beyond which the effect reverses. The results of rotation are demonstrated below. You can choose the look you want your image to have. You can practically eliminate the reflections or you can allow them to prominently show. The circular polarizer effect is most noticeable in skies at a 90° angle from the direction of the sunlight. Make a 90° angle with your thumb and first finger. Stretch out your arm and point that finger directly at the sun. Then rotate your wrist and arm around that pointed finger as far as you can in each direction. Where your thumbs points during the rotation is where the sky will be most-darkened by a CP filter. Observe the direction the sun based on the shadows. The dark sky is 90 degrees from the direction of the sunlight and less-darkened at angles closer to the sun. You must decide if the partially darkened sky is better than an all-bright sky for your situation. I usually find the partially-darkened sky to be my preference, but again, that decision is yours (or your client's). Remember the finger-pointing tip? Think about where the darkened skies will be at various times of the day based on the sun's position in the sky and apply that knowledge to your composition. An early or late day sun will place the ring of darkness nearly straight overhead and through a point on two sides of the horizon (shown in the above example). A mid-day sun, shining straight down, will place the ring of darkness at the horizon. This means that your mid-day wide angle circular polarizer images will have a more-evenly darkened sky. In the example above 24mm example, you can see the near-mid-day darkened sky creeping up slightly from the horizon. I do not use CP filters as frequently at the beginning and end of the day, but situations vary. Care must also be taken when shooting panoramas with a CP filter. Because the effective angle of view captured in a panorama is very wide, the uneven sky is likely to be even more pronounced. The example below illustrates this. The above picture also includes an erased rainbow. I'll explain. Care must be taken when shooting rainbows with a CP filter. A CP filter can cause a rainbow to disappear completely as illustrated in the previous panorama picture. This filter can also make the rainbow pop by darkening the sky around it. Or both can happen in the same picture. 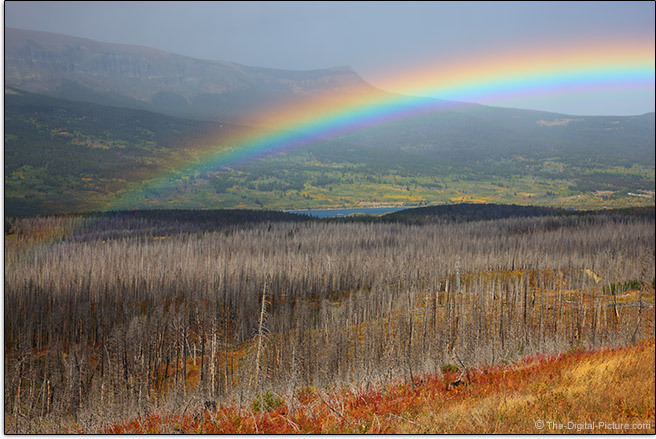 If both ends of a large rainbow are captured in a single frame, one end can be erased and the other enhanced. Let's take a look at a CP filter comparison example cropped from a 35mm lens-captured image. Which image do you like best? You like the "Full Effect" image best, right? The sky is dark; making the contrast between the white on the boat and the sky much stronger (this filter does the same with white clouds). 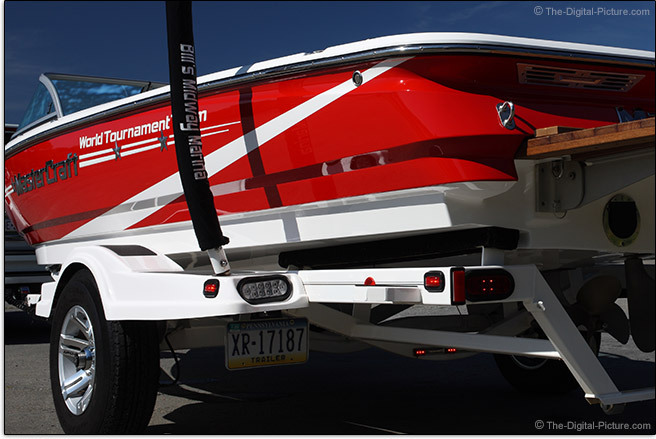 Glare is reduced on the upper side of the boat, the tires, the swim platform, the guide post pads and on many other small details. Reducing glare increases color saturation, resulting in a much more richly-colored image. But all is not better with the "Full Effect" image. Notice that the "Rotated 90°" filter position removes far fewer reflections, but it removes some different reflections. The filter is still attached and working. And in this position, the filter notably removes reflections on the narrow downward-angled edges toward the bottom of the boat. Also note in the above sample the strange effect caused by the tinted windshield. You will get strange effects when shooting through similar windows with this filter mounted. You will definitely want to remove the CP filter when shooting through commercial airplane windows. You will probably want to remove your sunglasses when using these filters. 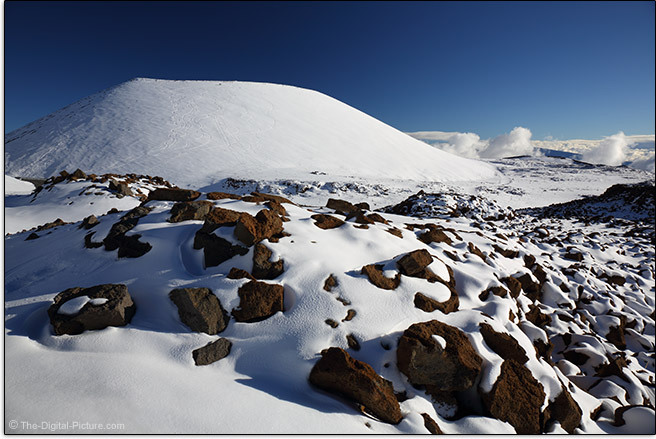 A circular polarizer filter is mandatory in a serious landscape photography kit. In case you haven't been already convinced of my opinion, I'll show you another comparison example. Which image below do you prefer? Ignore the slight framing difference in those images – that was not caused by the CP filter. But, notice the difference in reflections on the rocks, ferns and other leaves? Cutting the reflection, especially that coming off of foliage, will remarkably improve your landscape photography results. 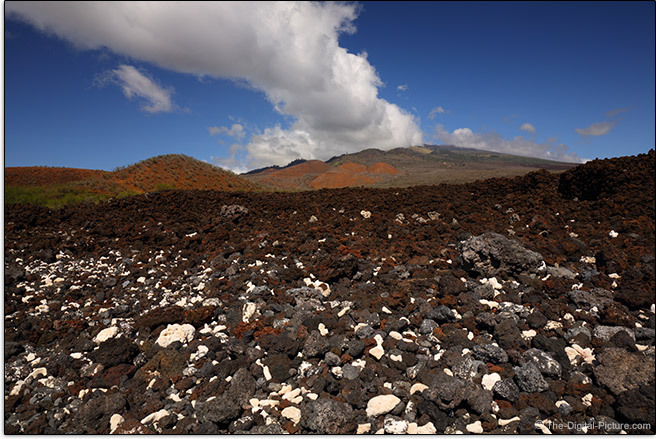 The circular polarizer filter causes colors to become rich and very saturated. Circular polarizer filters also double as weak neutral density filters. 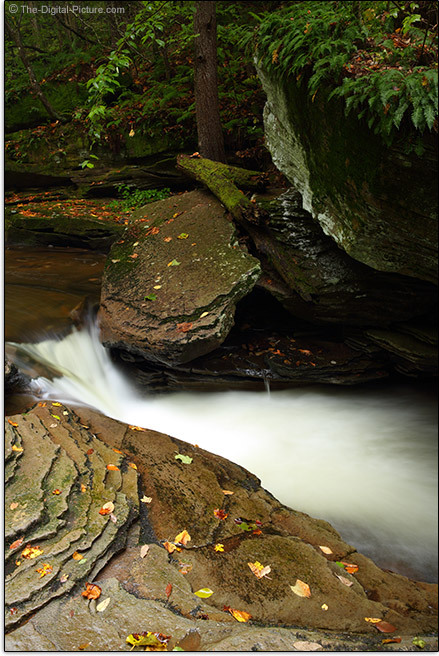 Expect a light loss of 1 to 2 stops when using the circular polarizer filter. This is good news for those situations when you want a longer exposure (such as to blur moving water), but bad news if you need a faster shutter speed or aperture. I usually prefer to be using an image stabilized lens when shooting handheld narrow-aperture landscape photos even under strong daylight, primarily due to this light loss. Not all filters are equal in the amount of light that they block. For example, B+W Kasemann HTC (High Transmission Circular) Polarizer MRC Filters block 1-1.5 stops less light than the non-HTC filters. That difference, equal to twice as much light or more, is a big deal in some circumstances. This is not a filter that most people leave on a lens all the time – CP filters are not used in all photography situations. As just discussed, there is less light reaching the sensor, so I seldom use a CP filter when shooting action and/or in low light. I generally do not use CP filters for portrait photography. But, the with or without filter choice is always yours. As you gain experience with your CP filter, you will learn when it does and does not make sense for you personally to use it. Yes, you can save money by purchasing a "linear" polarizer instead of a "circular" polarizer, but that decision will likely prove to be a mistake when attempting to use your camera's metering system and/or autofocus system. The "circular" version is designed to work properly with all DSLR camera functionality including autoexposure and autofocus. Unless you know what you are doing, you want the "circular" version. Unless you are changing filters in very harsh conditions (such as heavy salt water spray), I highly recommend not stacking a circular polarizer filter over a UV or clear protection filter. Stacking a CP filter over a neutral density filter can often make sense as they both contribute to the final image. Cheap, low quality filters are not acceptable. I do not consider a cheap, low quality filter to be acceptable for most circumstances. Many of these exist – do NOT buy them. They will degrade the quality of your pictures with ghosting, flare and loss of contrast being the primary issues. Image sharpness can also be affected. Perhaps if I knew that I was going to ruin the filter for a not-too-important shot, I might opt for a cheap/low quality model. But otherwise, I spent a lot of money for quality gear and I'm spending a lot of time (and perhaps expense) photographing something that is important to me. I'm not going to sacrifice my image quality by putting bad glass in front of my lens and neither should you. Get a quality filter. What is the best circular polarizer filter? While there is more than one brand offering filter options at a high quality level, I have made Schneider Optics B+W MRC filters my choice. The quality and performance of B+W MRC filters place them among the world's finest. I have also found the high end Hoya filters to be good (but those I have had were a pain to clean – they tended to smear). 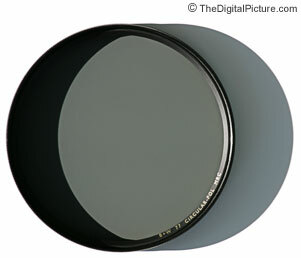 What is a Käsemann circular polarizer filter? "Like many German surnames, Käsemann is name describing a man’s trade, presumably ascribed to early cheese vendors (e.g., Schneider=one-who-cuts, i.e., a taylor, Fleischmann=flesh-man, i.e., a butcher, etc.). According to Wikipedia, the optics company Schneider (headquartered in Bad Kreuznach, Germany) bought B+W Filter Manufacturing Company in 1985 and in 1989 bought a company by the name of Käsemann (headquartered in Oberaudorf, Germany) that “manufactured glass and plastic polarizing materials”. A quick search on Google.de revealed that the latter company was founded by a man named Erwin Käsemann." Now we know. You will not likely see a visible improvement in image quality by using the Kasemann version of the filter – unless you encounter foil separation. The Kasemann filter version is more expensive, but the difference in cost (in the versions I checked at review time) has decreased enough that I recommend getting the better filter version. Very important for any filter is the ring. B+W's high quality matte black (to prevent reflections) anodized brass rings reduce binding/cross threading to ensure optimal alignment. You know you have a quality product in your hand when you pick up a B+W brass-ringed filter. To insure perfect alignment of the glass, B+W's CP filter glass is held in place by a rear threaded retaining ring. Filter rings come in various thicknesses. The standard thickness ring is the most-commonly chosen (B+W's F-Pro), but a slim ring is available for reduced vignetting on ultra wide angle lenses. Since CP filters are thicker than UV and clear protection filters, a slim ring version is more frequently needed. I have found that many 24-something-mm lenses on full frame bodies often require the slim ring. If using a full frame lens on an APS-C format body, the standard filter ring will probably work fine for you at any focal length. For most wide angle lenses (wider than 40mm), with and without B+W standard circular polarizer filter test results are available in the vignetting tool (look for the last focal length option). This tool allows comparison to determine if the standard B+W filter ring depth causes light to be blocked from reaching the sensor – mechanical vignetting. The first downside to a slim filter is often a higher price tag. The second and even more-unpleasant downside used to be the missing front filter threads. Standard thickness filters have front threads that allow another filter to be stacked and allow the standard lens cap to attach to the filter. Slim filters were shipping with an alternative slip-on friction-fit lens cap that, in my experience, was only one step above worthless. I found them in the bottom of my camera cases more than on my lenses. The good news is that most slim filters now have front threads, eliminated the biggest downside to using them. One more drawback to the slim filters is the reduced surface area available for rotating the filter. A slim ring more easily enables your fingers to come in contact with the glass, potentially causing a smudge/smear. Sight extra care must be taken to avoid this. A much better option for a slim filter ring is B+W's flagship XS-Pro Nano line. As mentioned above, this filter line includes B+W's best 8-layer MRC Nano coating and is Kasemann by default. The XS-Pro rings are slimmer than the standard ring thickness and lens caps can be attached to them. I have standardized on the XS-Pro filters for all of my wide angle needs. "It is a known cosmetic side effect (artifact) of the high performance polarizing foils that Schneider/B+W uses in its True-Pols to produce a "ripple reflection" to the human eye when viewing high intensity reflected light that "bounces" off the actual polarizing foil. This is simply a "reflected artifact" and is not transmitted through the lens. This effect is apparent when viewing the filter under certain specific lighting conditions (such as a bright table light being reflected off the polarizing foil's surface from 45 degrees behind the viewer). It appears as a slight visual "rippling" appearance in the virtual surface of the foil. You cannot see this effect under any other viewing conditions. It is an artifact from a reflection coming from the polarizing film. These filters are not cheap, but they are definitely worth the cost. While it is best to have one filter for each lens, or minimally one filter for each filter thread size you need, you may decide that multiple filters are not affordable. In that case, buy a filter sized for your largest filter thread sized lens and then purchase step-up filter rings to accommodate the rest of your lenses. At Photokina 2014, Schneider Optics introduced new HTC versions of their Kasemann polarizer filters. HTC stands for High Transmission Circular, with the primary benefit being higher light transmittance. B+W's renowned circular polarizer filters had a filter factor of 4-8x, resulting in a loss of up to 3 f-stops of light. The new HTC filters have a filter factor of 2-2.8x, resulting in approximately 1-1.5 stops of light loss. B+W cuts no corners with these filters including MRC Nano (easy-to-clean Multi-Resistant Coating) with 99.5% Light Transmission, Schott glass and brass ring construction, select foils and the newest laminate technology. The HTC filters are available in premium XS-Pro mount (my preference with thin ring, front threads and nano coating) or in the standard-thickness pro-grade F-Pro mount. Those looking to stop all blur in their images will find the high light transmittance to be a great asset. When shooting landscape at f/11 with a circular polarizer in place, shutter speeds are often marginal for handholding. Any wind can also create motion blur in flora. Gaining an extra stop means that shutter speeds can be twice as fast, better stopping both subject and camera motion. 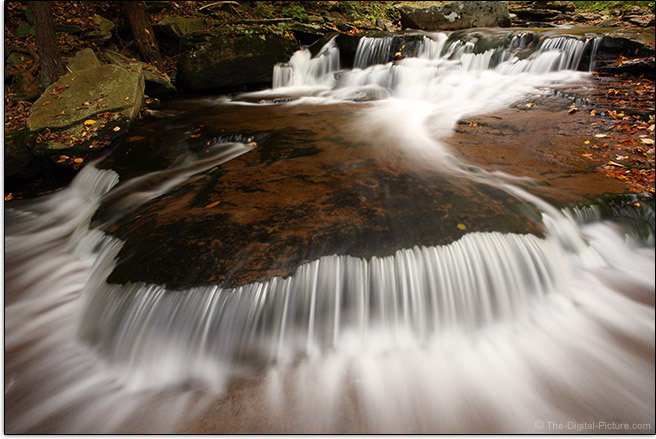 Those wanting motion blur in their images (such as when photographing waterfalls) when using an HTC filter may find that they need to use an ND filter more frequently to offset the brighter circular polarizer results. Or, have both available. I am using CP filters so much that I have both versions in my kit. Relatively new to the market, Breakthrough Photography boasts that their circular polarizers are the "world’s most color neutral". Many circular polarizer (and ND) filters impart a color cast to images captured with the filter in place and being color-neutral is a true advantage. In addition to being very color neutral, Breakthrough’s X4 circular polarizers are well-designed, optically excellent and have proven rugged and reliable for me under significant use. Breakthrough X4 circular polarizers are among my most-used filters. I highly recommend having very inexpensive lens filter wrenches with you when using CPL filters. One stuck filter will leave you with regrets of not following this advice. Why does it matter where you buy filters? Because filters are very easy to counterfeit. Buying from a trustworthy retailer insures that you are buying the product you want. The retailers I list below are my top recommendations, though care must be taken if using a 3rd party reseller on Amazon. As the wise saying goes, if the price appears too good to be true, it probably is. Some of my most striking pictures were taken using Circular Polarizer Filters. The resulting saturation is beautiful but still natural-appearing. I would be lost without this tool in my kit. I highly recommend you have at least one of these in your kit.